Did I tell you I love Halloween? What? Only 20 times? Well it’s that time of year again! I always wanted to throw a sick Halloween party for all my friends and because this is the biggest venue I have I’m going to do it here this year! Everybody is invited and the Halloween costumes are mandatory! I’m going to make a virtual board with mind blowing, yet simple DIY ideas for the ultimate Halloween party. I have already prepared a few heavily illustrated articles that I’m going to publish this week and the next that will detail the most important aspects for an out of this world Halloween bash: food&drinks, spooky decor, pumpkin carving and mood&music. 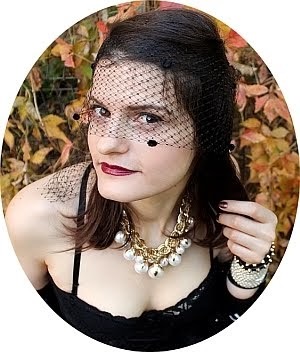 I’m even thinking to write something about Halloween costumes and makeup if you’re into it! 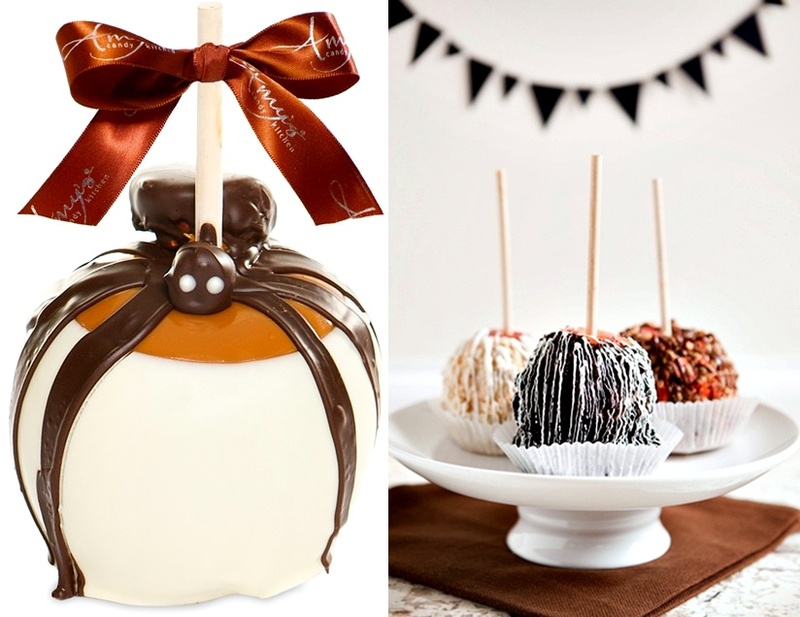 Today we’re talking thematic Halloween treats, appetizers and desserts. I’m not all that experienced in the kitchen so I looked for simple ideas that also happen to have a great visual impact. Don’t worry, these are easy, affordable Halloween recipes - anybody should be able to make them happen without breaking a sweat or spending a fortune in the process. 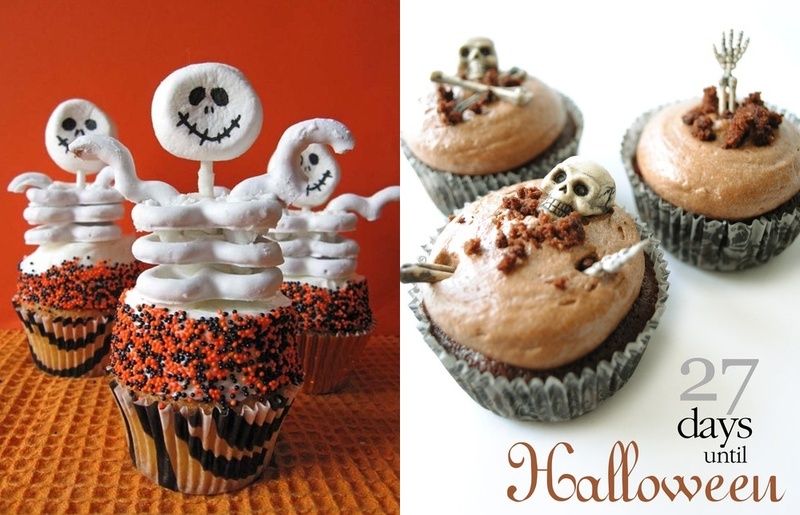 Cupcakes are always a crowd-pleaser and Halloween cupcakes are sure to be a hit! Use your favorite recipe for the cupcake mix - they should taste great, but the important thing is the look. I suggest coloring the frosting orange, purple and white and using chocolate, sprinkles and candy corn to create spiders, mummies, ghosts, pumpkins on the top. These two Halloween cupcakes ideas are pure genius and so simple: just add crystallized sugar shaped like broken glass and red topping/strawberry jam on a white frosted cupcake for a Psycho Glass covered cupcake end result. 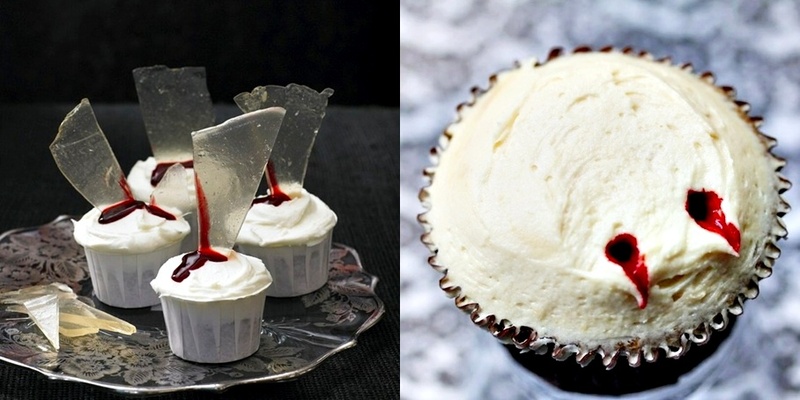 The vampire bite cupcake is even easier: just punch two round holes in the white frosted cupcake and fill them with red topping or a red, sweet jam and you're done! The cupcakes on the left seem complicated but if you look closely they are really simple: you start with a white cupcake covered in tiny black&orange sprinkles (you can use a big marshmallow instead of white frosting), then add a round cookie on a pretzel stick for the head (draw "the face" with black chocolate), three whole pretzels for the rib cage and finally two broken pretzel pieces for the arms - everything covered in white chocolate - and you get an impressive Halloween skeleton cupcake. 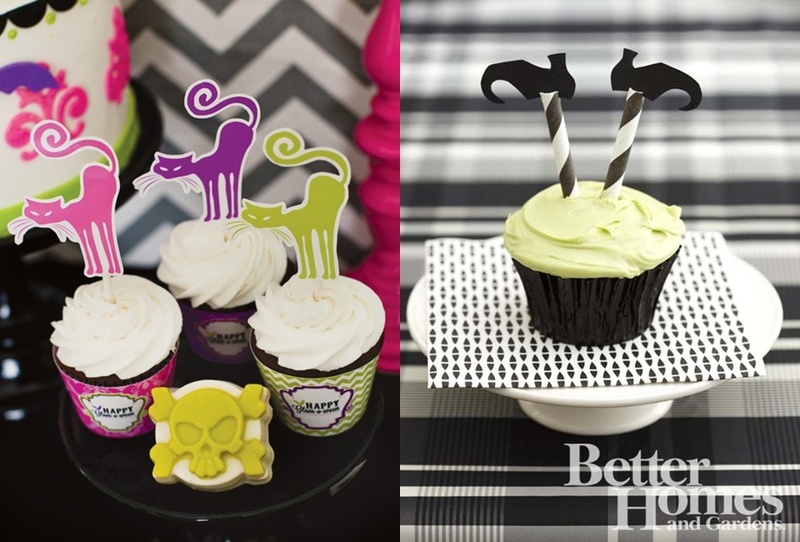 For the creepy skull cupcakes on the right you'll need (edible) skulls and bones that you can buy or make yourself by skillfully molding some marzipan (add some crumpled cupcake mix with extra cocoa to give the impression the skeletons are coming out of the grave)! 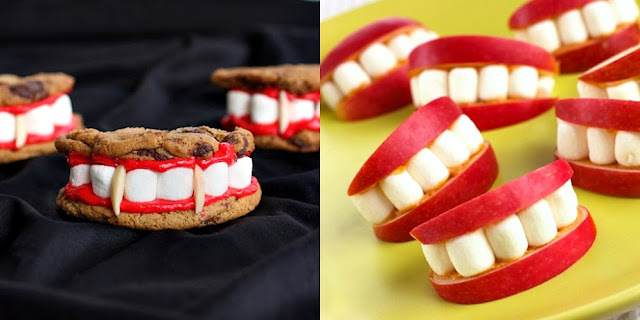 Another fun Halloween food idea is the Dracula's teeth cookie. You can make them using: dyed frosting, marshmallows and almonds or just apple slices and mini-marshmallows for a healthier version. Adorable witch hat, pumpkin and black cat Halloween cupcakes that you can make using colorful frosting, marzipan and a bit of patience. Prepare a wonderful Dessert Table using the staple Halloween colors: orange, yellow, chocolate and white. 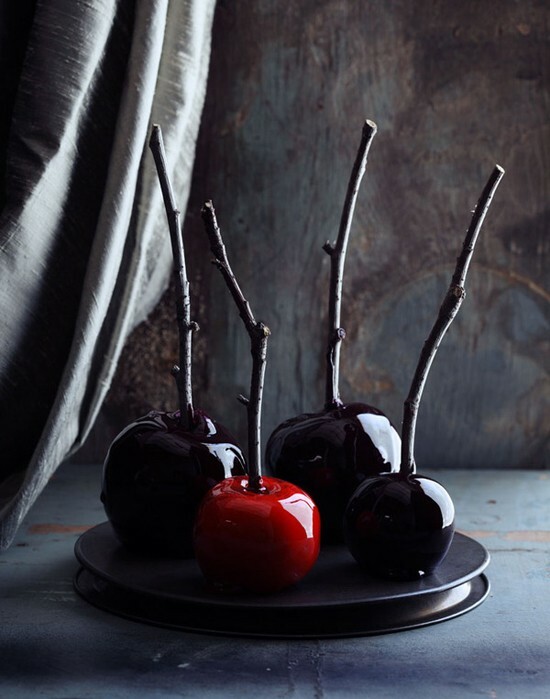 Poisoned Halloween apples - they look wonderfully scary because the molted sugar they are covered in has a bit of dark food coloring in it, the coarse branches as sticks are a very cool touch! 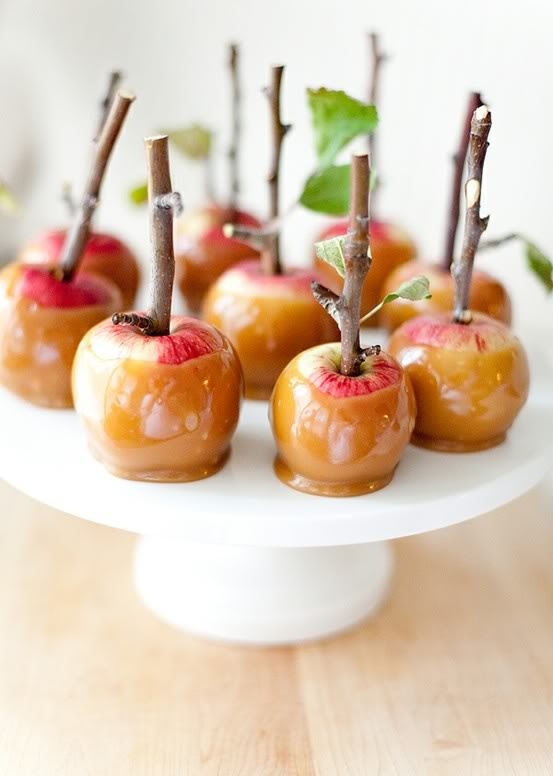 Halloween caramel apple treats - note the branches as sticks again, these still have a few leafs on them - so very cool! 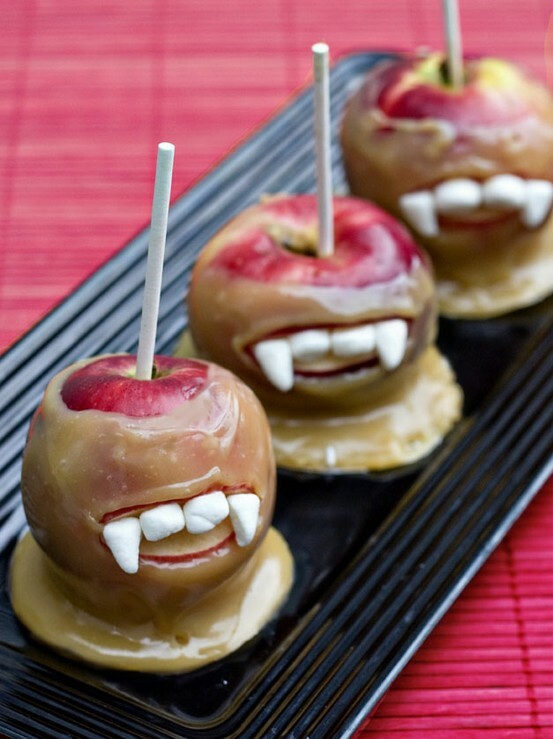 Vampire apples - make them by covering some nice, red apples in caramel and chocolate, carving a mouth shape on the apple and filling it with marshmallow teethes. Halloween caramelized apples again, but with a chocolate twist: how amazing is the spider shape given to the apple in the left photo using different shades of liquid chocolate; the ones on the right have minced almonds/nuts added in the chocolate! 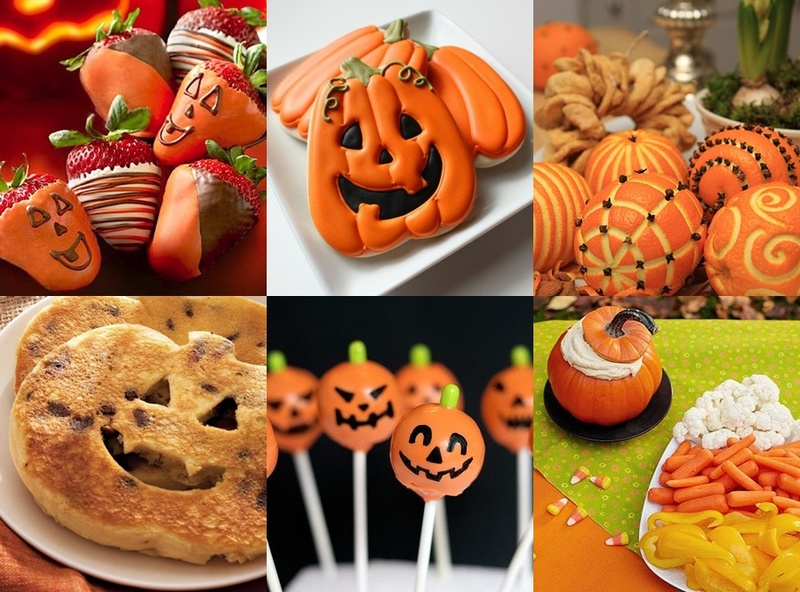 More great Halloween party ideas: strawberries covered in orange chocolate, pumpkin shaped cookies and pancakes, carved oranges and cloves to decorate and scent your home, scary lollipops. As for some Halloween appetizers - cut a small pumpkin, fill it with your favorite dip/cheese an use it as a serving pot, make a Halloween vegetable plate using yellow peppers, baby carrots and cauliflower. That lemonade looks amazing, the metal skeleton holding the huge jar and the round lime slices make it look really creepy. And how about the black cocktail glasses with mini-marshmallow eyes - what an amazing touch for a Halloween table. Blood oranges, white and black grapes are amazing cocktail toppers! 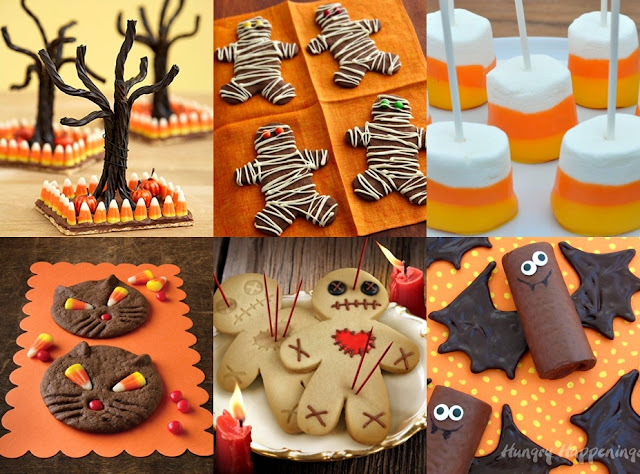 Talking about fun Halloween food, here you have some more easy options: twisted trees table topper made out of licorice using a square chocolate biscuit as a base and candy corn for decorating, gingerbread mummies, marshmallows that mimic the colors of candy corn, black cat cookies, voodoo doll cookies and chocolate snack cake bats. 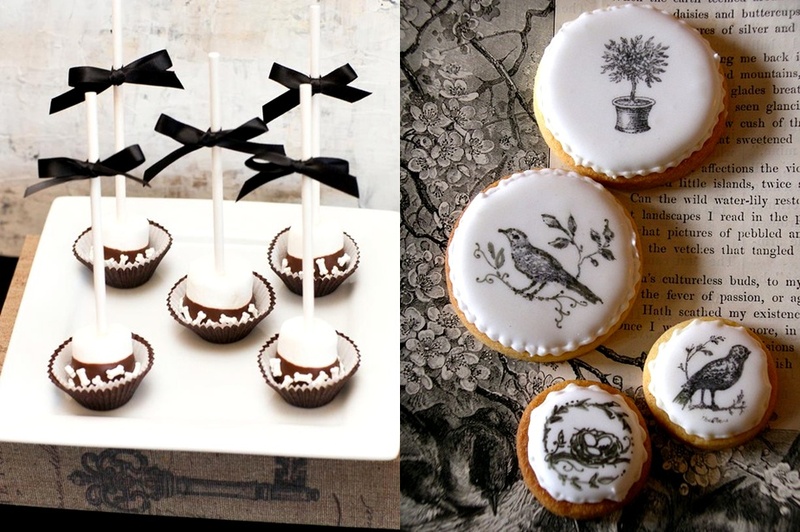 More creepy Halloween food ideas - how about some grave stone desserts and appetizers? I especially like the pudding tomb stone served in a glass with crumbled chocolate (the fresh ground), a round biscuit (write RIP on it using black chocolate) and even a tiny orange flower!!!! The coffin sandwich is pure genius as well: make normal sandwiches (use dark bread), cut them in the coffin shape and add salmon, pepper or carrot crosses on top! 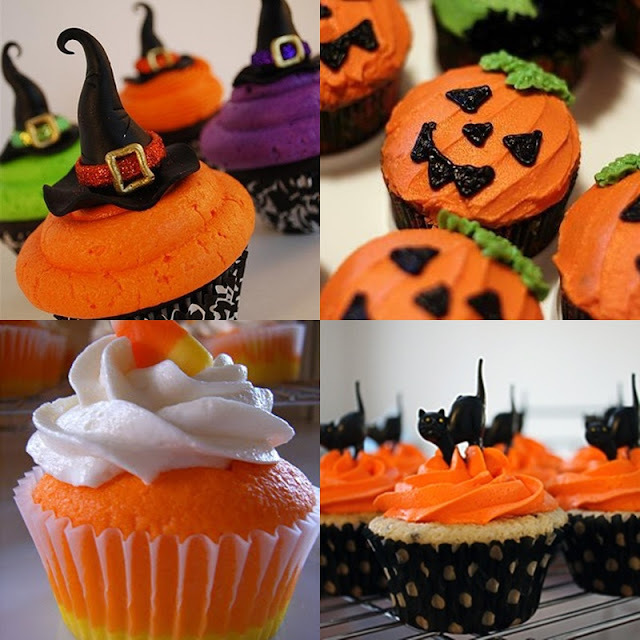 Easy and creative Halloween DIY dessert ideas : mummies cupcakes, spider and bats cookies, ghosts made out of mash potatoes, tiny pumpkins made out of boiled carrots with parsley leafs, green ice creams scoops with witch hats, oranges carved to look like Halloween pumpkins. 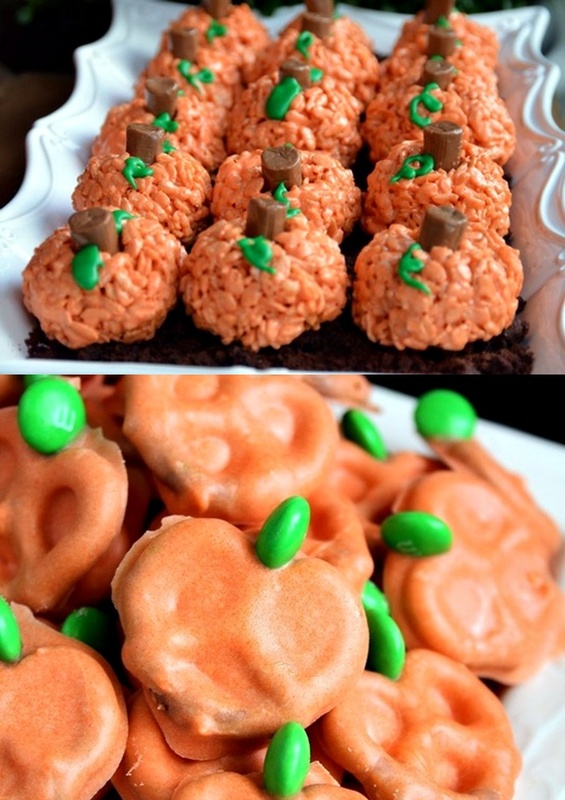 Top photo: Rice Krispie Pumpkins - make regular rice krispies and add orange food coloring (mix red and yellow to get orange), shape into balls, add a tootsie roll for a stem and green icing on for leaves. Bottom photo: Pumpkin pretzels - cover in orange chocolate (basically white chocolate colored with orange food coloring) and green M&M's. 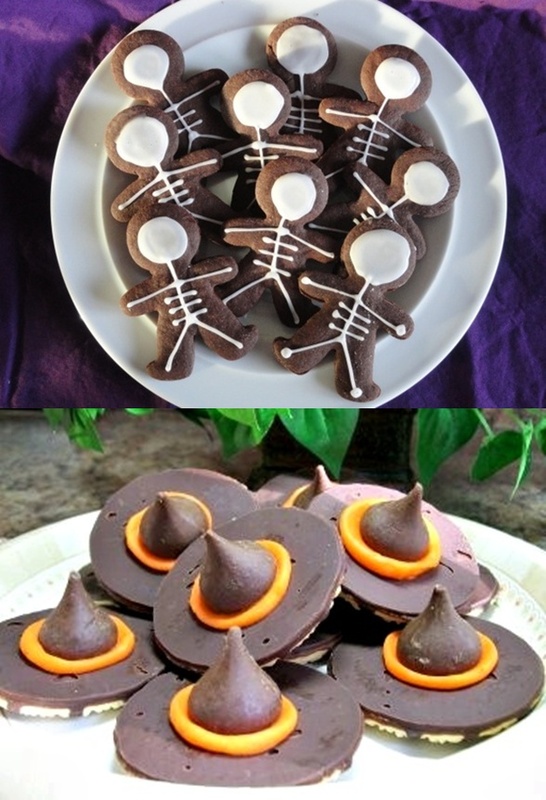 Fun Halloween food: skeleton cookies and witch hats made out of Hershey Kisses, on a fudge stripe round cookie and orange icing. 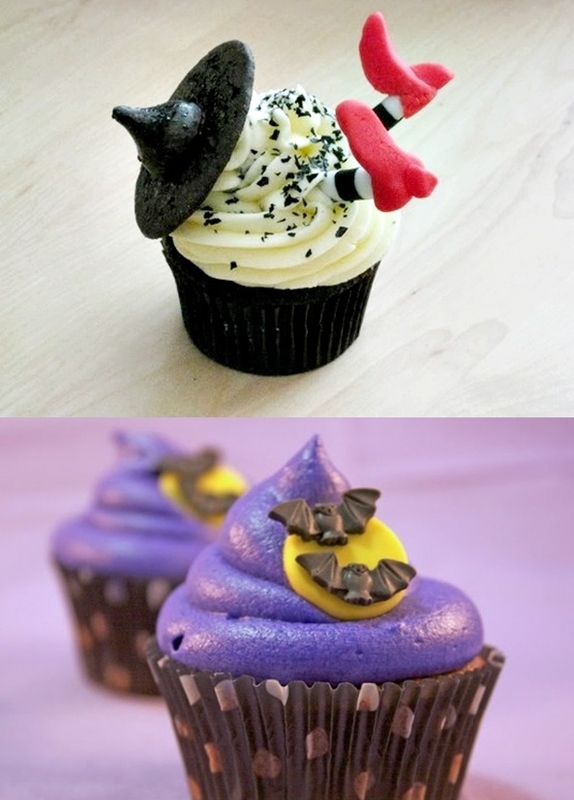 Some more witch and bats Halloween themed cupcakes! So very cute! Simple Halloween food ideas - owl cupcakes (take a normal chocolate cupcake and decorated with black&white Orios and M&m's for the eyes and nose of the owl), spider appetizers (salty crackers, cheese cube, toothpick with gross plastic bug on top), Halloween fruit skewers (only use yellow, red and orange fruits, don't forget about the plastic bat at the top of the pick). Let's talk Halloween cakes now - not so much Halloween cakes recipes (you can use your favorite and go from there) but more Halloween cake decoration ideas. 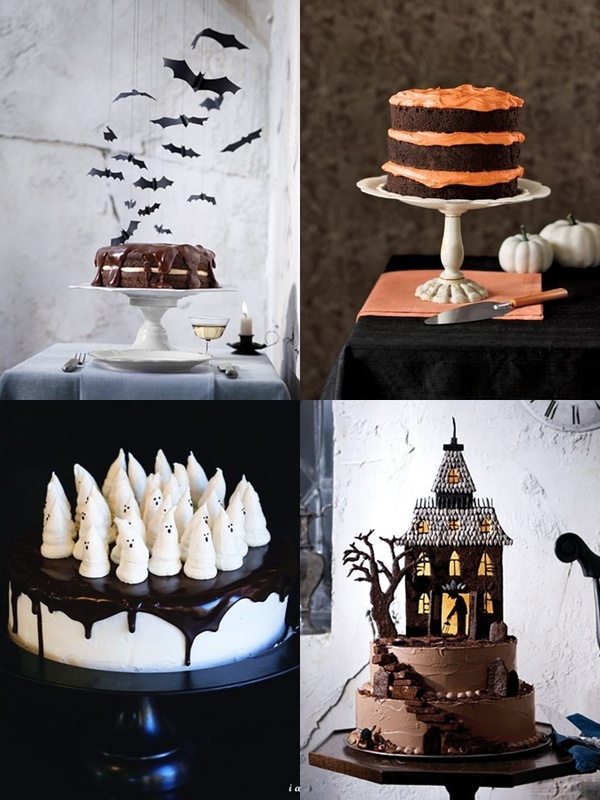 The first three are fairly easy: it's all in the orange frosting, black chocolate dripping over an all white cake, icing or marzipan ghosts. The haunted house Halloween cake is quite elaborate but maybe you can use the inspiration to make a poor man version of it. Easy Halloween Cakes - colorful spider web cake (use orange, green, purple food coloring for the different layers of the cake), spider cake (use a spider stencil), cute white ghost cake! 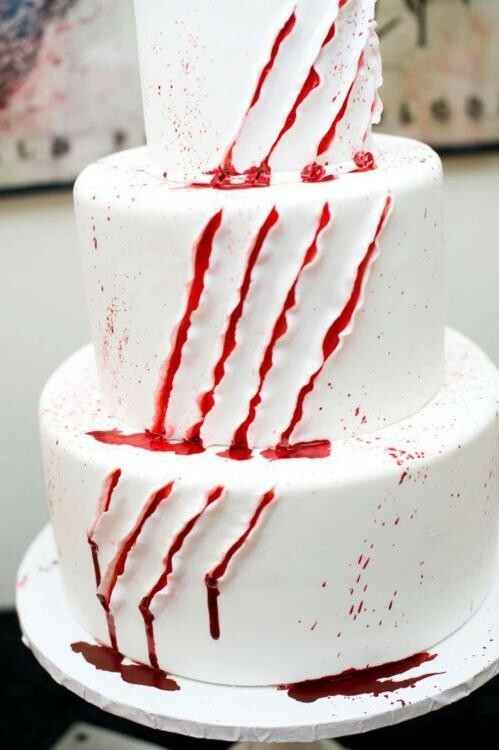 This Vampire Scrach/ Freddie Krueger cake is such an easy Halloween cake and oh, so creepy - just make a simple white cake, add gory scrapes and blood like drops all over and filled them with red frosting or topping. The following Halloween cakes are basically works of art that I would never be able to make or eat because they are so damn beautiful! 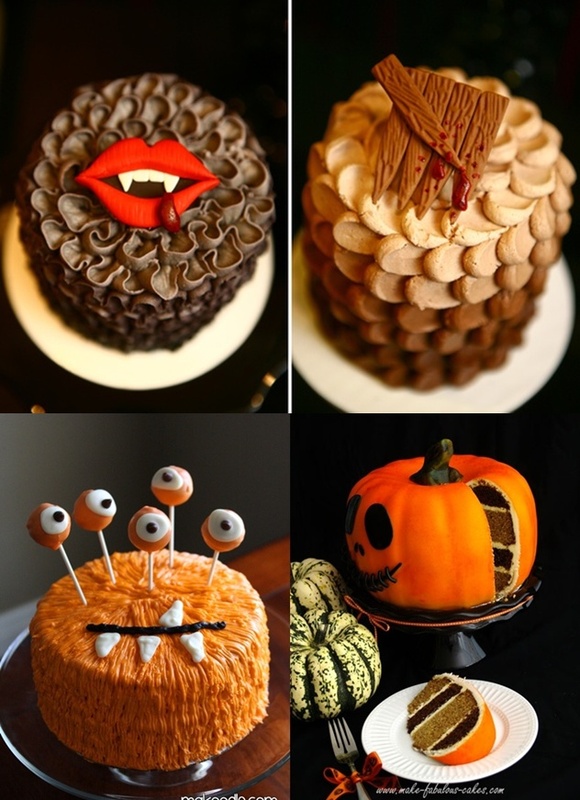 The top two are True Blood inspired, then on the bottom we have a monster cake and very life like, scary pumpkin cake. 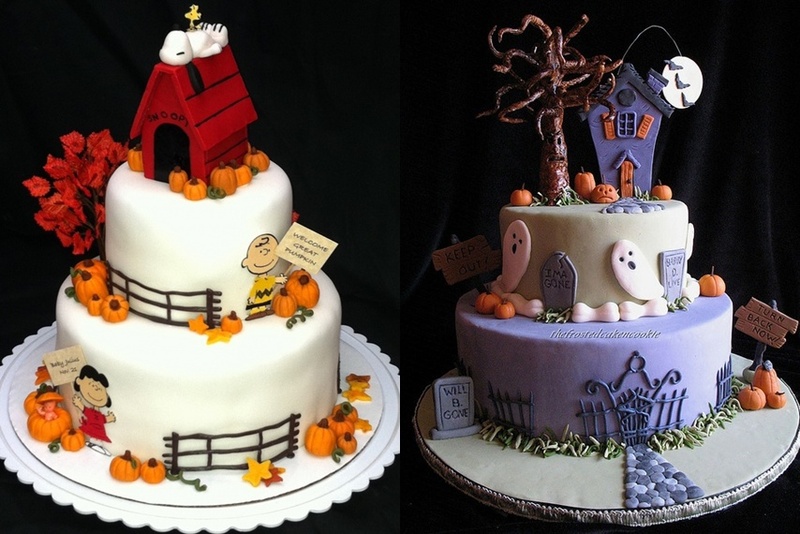 A wonderful fall cake and a Halloween themed purple and white cake! So beautiful!!! 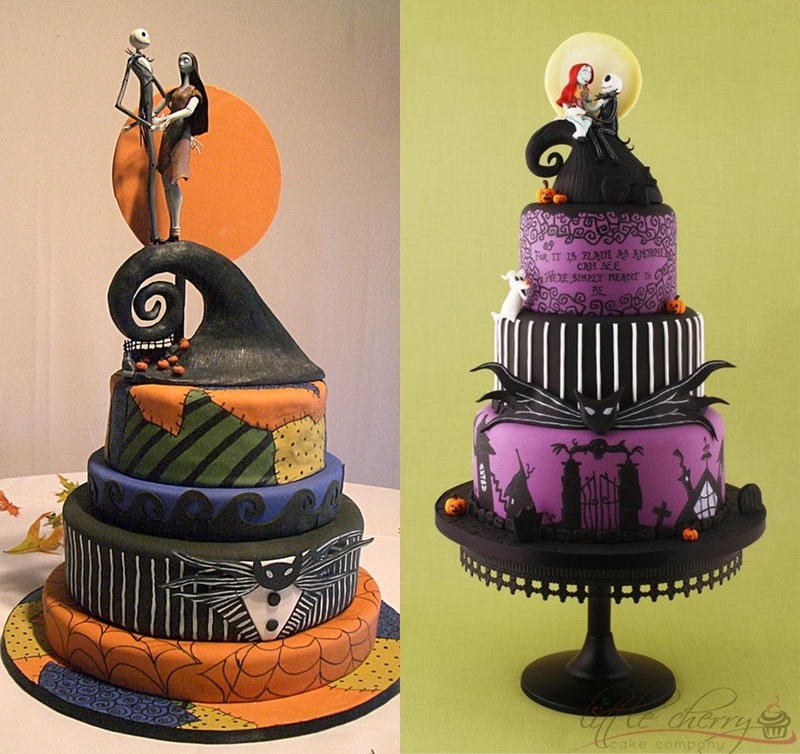 These two Tim Burton inspired Halloween cakes are too amazing for words! I mean, look at those toppers! Absolute perfection! I could never eat them - I would probably end up like Miss Havisham still having the cake 40 years later - hopefully it's just gonna be a picture of them! What do you think? 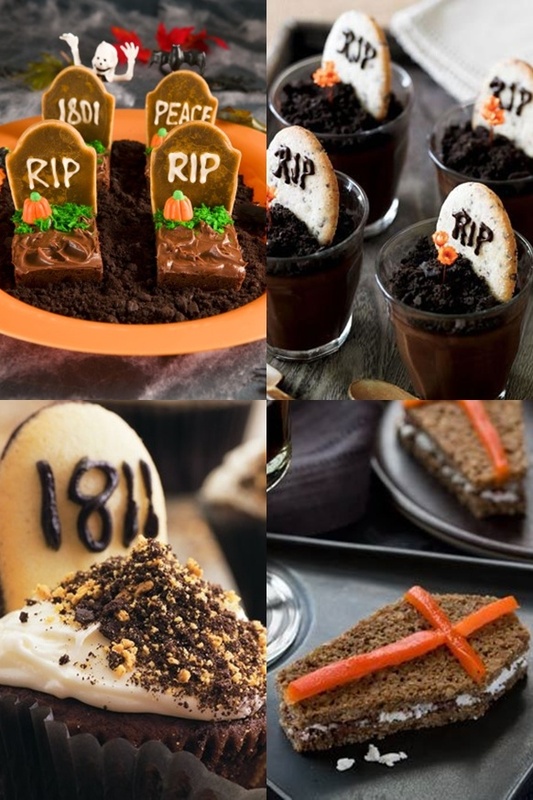 Got any Halloween dessert ideas from here? Plan to put some of them into practice? OMG this is the best post ever! haha so inspiring i seriously love everything! I Wanna try them all It really looks delicious. 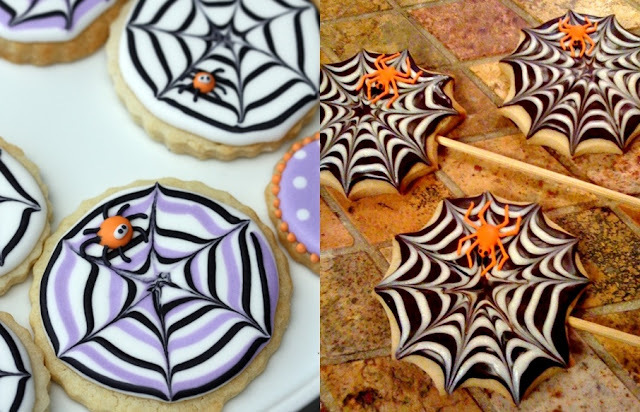 I LOVE the idea of the cookies with the fangs... such a great idea! Thanks for sharing. oh, so inspiring for halloween parties and get togethers! i love this season! you just made me soooo hungry~ thanks for all the inspo! oh wow what a fantastic post! i love all things halloween, i just love pumkins and cats and skulls and witches full stop :) I love eveything here with thte marshmellow teeth! especially the cookies (i need to find veggie marshmellows) and the cute skeletons climbing out of the cupcakes! Oh my, so many ideas for Halloween. This is probably the first post that has all these ideas in one. Amazing! OMG, I love Halloween and I can´t believe you found so much great halloween food, I want to have every piece! Thanks for following my blog, I love yours too and follow back now :-)! omg the black apples are so intense, but such a great idea! thank you for finding all of these great treats and sharing it with us! thank you for these amazing ideas!! We´re from Spain so we don´t celebrate halloween!!! Yeah, we´re really sad about it and after seeing all these awesome stuff we´re even most sad!! We´re gonna go some day to the states to have a decent halloween!!! Wow these are amazing!!! 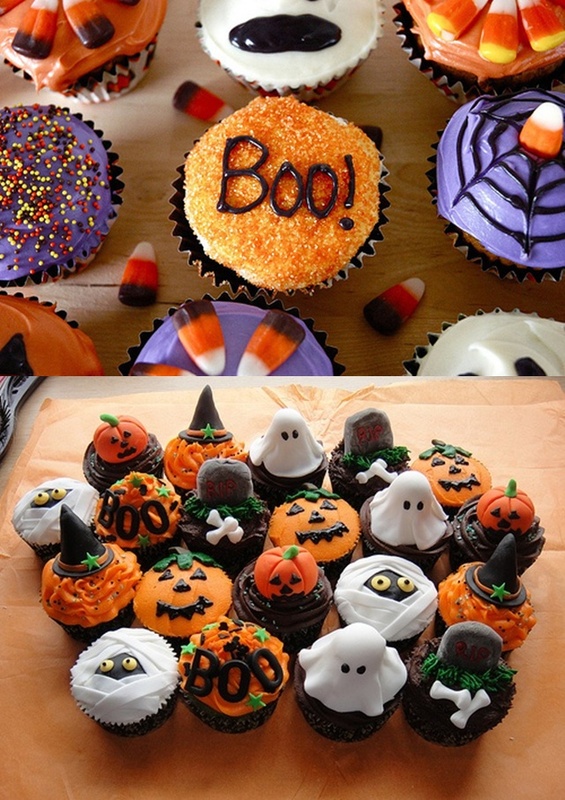 I I'm wanting to do my own halloween baking so this is perfect inspiration! I absolutely HAVE to try some of these things!!! look delicious and soo funny! love it! I love your collection of Halloween food ideas for party. Thanks for sharing!